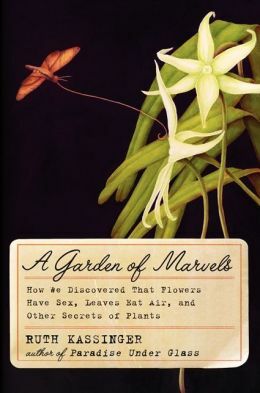 A quirky illustrated reference guide to the oddities of the plant world and botanical history. Broccoli as we know it today comes to us as a product of early bioengineering (by the Etruscans around 800 B.C.). Eve’s forbidden fruit may have been not an apple, but a fig. In Aztec culture, virgins were not permitted to look upon the lusty avocado fruit on the tree. The blister bush contains chemicals that interact with human skin and then combust upon exposure to sunlight. In Greek mythology, the artichoke was created when Zeus became angry with his mistress and transformed her into the thistle as punishment. Bamboo blooms only every 65 or 120 years, and when it does, rat populations explode. Nutmeg has mild hallucinogenic properties. From Absinthe to Żubrówka (“widely known as the plant that makes the best Polish vodka”), The Big, Bad Book of Botany is not your standard reference book. 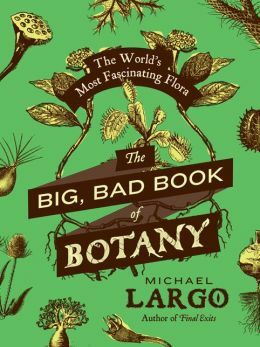 It is far from comprehensive; Michael Largo (The Big, Bad Book of Beasts) instead hopes to entertain and educate by focusing on plants with odd characteristics and their history and roles in different cultures, including medicinal uses both current and bygone. Entries are alphabetically ordered (although some take a little hunting: oleander is filed under B for “Be-Still Tree”), and accompanied by some 150 illustrations by the artists of the Tropical Botanic Artists collective. Some entries include tips on gardening or on avoiding poisoning. Simply written with an eye for humor and cocktail-party-friendly trivia, this botanical exploration can serve as a coffee-table piece or conversation starter. Just don’t mix up your yew with your yerba. This review originally ran in the August 5, 2014 issue of Shelf Awareness for Readers. To subscribe, click here, and you’ll receive two issues per week of book reviews and other bookish fun! The Great Barrier Reef is both easily understood and awe-inspiring in this history of its discovery, exploitation and beauty. With The Reef, Iain McCalman (Darwin’s Armada) has composed “a passionate history” of the Great Barrier Reef, opening with his own long-awaited voyage (part of a reenactment of Captain Cook’s original trip). 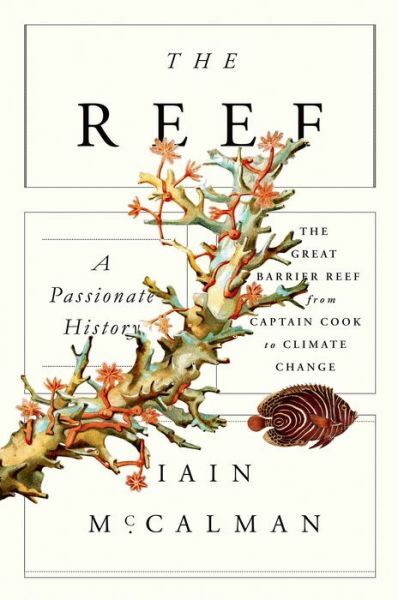 Following the prologue, he withdraws to the role of historian rather than participant, and chronicles the Great Barrier Reef as known to Western society over the last few centuries. The Reef is divided into three parts. Beginning in 1770 with Captain Cook and proceeding through later explorers who helped chart the reefs in the 1800s, “Terror” emphasizes the threat the reef posed to ships and their navigators, and the fear of cannibals and others thought to inhabit the area. In Part II, “Nurture,” the reef begins to offer refuge for those seeking to escape civilization or make a fresh start. Europeans are taken in by native islanders, or discover island paradise; naturalists arrive, captivated by the biodiversity and beauty of the area while beginning to realize that coral is a resource that can be exploited. “Wonder” sees the scientific community take an interest, disagreeing about the origins and biology of the reef. Ecology emerges as a new field of study, its proponents seeking to place the reef in the larger context of other natural environments, to study relationships and cause and effect. Individual activists work to defend the unusual and changing ecosystem from mining, oil spills, overfishing and the rough use of tourism. At the end, we are introduced to nature-loving scientist J.E.N. Veron, nicknamed “Charlie” after Charles Darwin, an engaging character who communicates the final dire message of the Great Barrier Reef’s looming extinction. 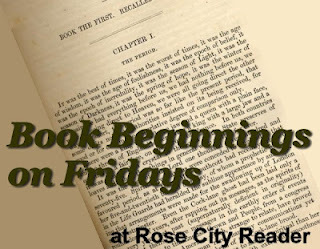 Returning to the personal nature of his prologue, McCalman’s epilogue speaks to the grim consequences of climate change but holds forth hope as well. The few images in The Reef include portraits of the personalities involved but not the corals themselves (although McCalman refers his reader to books that offer the latter). This work’s strengths include a coherent structure, friendly narrative style and a reasoned culminating call to action that does not disrupt its primary role as a comprehensive history. Plentiful notes indicate strong research, but McCalman’s writing is accessible to any reader interested in the intersection of science, nature and history. From perceived threat to resource to paradise destination to climate-change indicator–Charlie Veron calls corals “the canaries of climate change”–the Great Barrier Reef is fully explored in this engaging study. This review originally ran as a *starred review* in the May 6, 2014 issue of Shelf Awareness for the Book Trade. To subscribe, click here. I’m sure I don’t have to explain to you my interest in a book called The Drunken Botanist. I didn’t even look any further than the title; I requested it from my local library on that alone. Amy Stewart opens with an anecdote: she was at a convention for “garden writers” when a colleague confessed he didn’t know what to do with a bottle of gin he’d received as a gift. She scolds him for being unaware that a botanist, of all people, should know all about booze: alcohol comes from plants to begin with, after all! I confess I hadn’t thought of it that way, of course, but I continued to be hooked. The book is organized by: how we make alcohol (fermentation and distillation); what we make it from (alphabetically, agave through wheat); what we flavor it with (herb & spices, flowers, trees, fruit, nuts & seeds); and flavorings and garnishes (herbs, flowers, trees, berries & vines, fruits & vegetables). Throughout are dispersed cocktail recipes, instructions for syrups, infusions and garnishes, and gardening or growing tips. She stops short of homebrew advice, although the practice is alluded to many times. There are also several “bugs in booze” subsections: noble rot, yeast carriers, and the worm in the mezcal. Stewart seems to have a fondness for hard alcohol: beer and wine get rather cursory treatment by comparison, at least to my eyes. Possibly that’s my bias showing through, and to be fair, beer or wine individually could fill its own book (or many of them – and they’re already out there). I find that she did a much finer job of sampling the wide world of distilled spirits than she did of sampling the wide world of beer or wine; but maybe if I knew more about the distilled spirits I wouldn’t feel that way. Certainly, as a beer lover first and foremost, I was sadly disappointed in her treatment of that category of booze. However, this didn’t badly hurt my feelings about the book as a whole, because there are plenty of good books on beer. That’s not what this book was all about. I really enjoyed Stewart’s passion, and her drink recipes and tips are much appreciated. In fact, don’t tell him, but I’ve already ordered a print copy of this book for my main bartender, and he will receive this gift with my requests carefully marked within. I also enjoyed the broad education of all the things we make booze from, and some of the wild trivia I learned. I made several notes and/or paused to tell Husband: “did you know there’s a thing called pechuga mezcal? They hang a piece of raw chicken in the air above the still!” “There’s such a thing as a ‘burpless’ celery!” What fun. 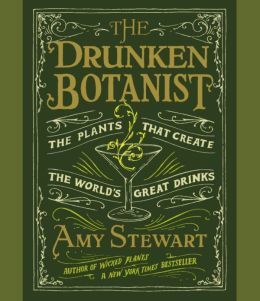 By no means comprehensive, of course, The Drunken Botanist is still an enjoyable, useful, entertaining introduction to “the plants that create the world’s great drinks” (and the less-than-great ones, too). I heartily enjoyed Stewart’s book, with the exception of just a few frustrating moments when I wished she’d gone further into the beer bits. (Forgiven, as I said above. But noted: just a few frustrating moments.) However, I would advise against the audio version. For one thing, listening to recipes is not the right way to do it. With the kind of information being related, I think reading is far preferable to listening. And, I got a little lost within her organization of information, too. I think being able to see headings and subheadings would have helped a lot. Finally, while I liked reader Coleen Marlo’s voice and the personality she gave to the reading, I felt that she talked way too fast – quite possibly for any audiobook, but particularly for this one, again, considering its reference-style informational offerings and recipes. The gardening tips were a little over my head, but your mileage may vary. I wouldn’t say that I have a black thumb, exactly, but the whole program baffles me. I appreciated the introduction I got from A Garden of Marvels, although that one, too, seemed to consider “basic” or “easy” some concepts that lost me. I definitely dig Stewart’s advice, just don’t know if I’ll be growing my own any time soon. Verdict? Don’t miss this one if you love booze & plants! But get the print copy! 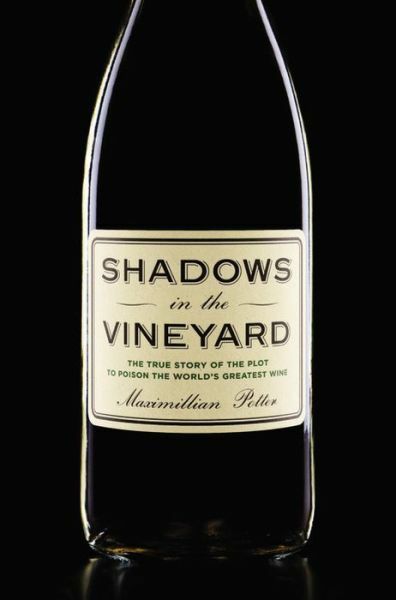 If you’re a gardener, I hope this book inspires a cocktail party. If you’re a bartender, I hope you’re persuaded to put up a greenhouse, or at least plant a window box. I think that puts it very well and succinctly, and I’m on board.